Asthma symptoms can worsen for a range of environmental and occupational reasons. At least half of all asthma exacerbations are caused by respiratory viruses, but there are microbiological causes too. Asthma is a chronic inflammatory condition of the airways. It is often difficult to diagnose as the symptoms (wheeze, difficulty breathing) are common to other illnesses such as respiratory tract infections and obesity. “Viral-induced wheeze” and cough are common in young children with respiratory infections, but is not necessarily caused by asthma. The disease is characterised by episodes of wheezing, breathlessness and chest tightness due to widespread narrowing of the airways in the lungs, known as exacerbations. Exacerbations can vary from mild to severe, and result in periods of incapacity, emergency hospital admissions and, rarely, death. occupational exposures to specific allergens and irritants, including dust and fumes. One in ten Australians suffer from asthma. The prevalence of asthma in Australian children increased between 1982 and 1992, but has now declined in children since 2001 and stabilised in adults. Asthma is a significant health problem in Australia, and in 2006–07 the number of Australians hospitalised due to this disease reached well over 36,000 people. It has been predicted that over the next two decades, asthma will continue to rank as one of the major causes of disease burden in Australia. With this there is also great cost. The most recent data show that $606 million was spent on asthma in 2004–05 (1.2% of all health expenditure in that year). While there is currently no cure for asthma, inhaled corticosteroids and other medications are available to control the disease and prevent exacerbations. The underlying causes of asthma are not yet well understood, but it appears that a combination of pre-disposing genetic factors and certain environmental factors cause an individual to develop chronic asthma. Respiratory viruses cause up to 90% of asthma exacerbations in children. The most common viruses responsible are human rhinoviruses (HRVs), respiratory syncytial virus (RSV), human metapneumovirus (hMPV) and influenza viruses (see Table). HRVs are the most frequently detected respiratory pathogen, and typically cause the common cold. Annually HRVs infect billions of people worldwide and cost billions in healthcare dollars. HRVs were discovered as the common cold pathogen over 50 years ago, with the first classical strain discovered in 1956. There are approximately 160 types, and together they cause a wide range of clinical outcomes infecting both upper and lower respiratory tracts. In addition to the common cold, infections with HRV can be asymptomatic but can also cause severe lower respiratory illnesses such as exacerbations of asthma and even pneumonia. HRVs are a large group of genetically diverse RNA viruses classified into three different species. The classical serotypes are found within species A and B, with another 50 additional strains recently identified as being part of species C.
The development of more sensitive molecular techniques has enabled scientists to detect more HRVs and other respiratory virus infections, and gain a greater appreciation of the broad range of clinical illnesses caused by HRVs. By using these techniques, viral respiratory infections have been detected in up to 85% of asthma exacerbations in children and about 50% in adults. Of these infections, approximately two-thirds are caused by HRVs. Of the three species, HRV-A and HRV-C are more common in infections and exacerbations. It has been shown that almost half of all hospitalisations due to HRV infections were associated with HRV-C, suggesting that this group causes a substantial burden of paediatric disease. Multiple strains of HRV circulate at any one time during a season, with children having several HRV infections per year. HRVs are present year-round, with all three species being represented, but in temperate climates there are peaks of HRV infections in autumn and spring, coinciding with return to school after holidays. Exacerbations of asthma and hospital admissions for asthma also show distinct peaks in autumn and spring, suggesting that viral infections could be major contributors to seasonal asthma morbidity. The seasonal prevalence of different HRV subtypes has also been examined with the proportion of respiratory infections in which HRV-B and HRV-C were detected being the lowest in summer, and more common in autumn. It also appears that with this seasonal variation, HRV-C seems to exchange its dominance with HRV-A. Approximately one-third of infants who have an acute viral wheezing illness will go on to develop more common wheezing events. However, most wheezing illnesses in infancy will resolve with no long-term effects. A number of birth cohort studies have shown that viral respiratory illnesses early on in life may promote asthma in some children. Sigurs and colleagues (Thorax 2010, 65, 1045–52) studied 47 children hospitalised due to RSV infection in their first year of life, and 93 age- and gender-matched controls for 18 years. The cohort infected with RSV had a high prevalence of early-onset allergy-associated wheeze, increased airway hyper-responsiveness and reduced airway function at 18 years of age. The RSV group had a higher incidence of parental asthma/atopy compared with the control group (indicating the children were at “high-risk” of developing asthma), but the difference was not significant. Jackson and colleagues (Am J Respir Crit Care Med 2008, 178, 667–72) enrolled 289 genetically “high-risk” children at birth into the NIH-funded Childhood Origins of ASThma study (COAST) based on one or both of their parents having asthma/allergies. Children who had a wheezing respiratory illness caused by HRV in the first 3 years of life had a tenfold increase in asthma risk at age 6. HRV infection without wheeze was not associated with an increased asthma diagnosis at age 6. RSV wheezing illness was associated with a smaller increase in asthma risk at 6 years. An Australian birth cohort study has also found that more wheezing illnesses in infants are caused by HRV than RSV. But do early-life infections with HRV or RSV necessarily cause asthma? Whether it is causal or genetic factors linking HRV and RSV to asthma later in life is still not known and much debated. Kuehni and colleagues (Am J Respir Crit Care Med 2009, 179, 1079–80) argued that existing evidence shows it is more likely that a genetic predisposition for asthma renders an individual more susceptible to worse illness caused by RSV in early life, rather than RSV being the cause of asthma development. It may be that, as hypothesised by Jackson and colleagues, in genetically high-risk individuals, HRV and RSV infections cause pathological changes in the lungs which have lasting effects and lead to asthma. However, not all infants who wheeze with a viral infection will go on to develop asthma. Further studies are needed to resolve this question. Respiratory viruses are important in children with asthma, but bacteria and fungi can also cause exacerbations of asthma, and are more important in older children and adults. Recent studies of Mycoplasma pneumoniae, Chlamydia pneumoniae and Legionella pneumophila have looked at the associations of these atypical bacteria with both acute exacerbations and chronic cases of asthma. Evidence from human studies have linked both M. pneumoniae and C. pneumoniae to cases of prevalent asthma and even new cases of wheezing, indicating they could play possible roles in promoting airway inflammation. Gil and colleagues (Annals of Allergy 1993, 70, 23–5) found that M. pneumoniae colonised at a higher rate in patients with asthma (24.7%) than those without (5.7%), possibly inducing the wheezing events. Qasem and colleagues (J Infect Publ Health 2013, 6, 134–41), in a study of both asthmatic and non-asthmatic patients, found that M. pneumoniae was more common in asthmatic patients and was also related to the exacerbation of asthma symptoms (patients with suspected viral infections were excluded from this study). In a study conducted in France of children with known asthma and children with a new diagnosis of asthma, Biscardi and colleagues (Clin Infect Dis 2004, 38, 1341–6) found that M. pneumoniae and C. pneumoniae were found in both groups of children, but at higher infection rates in those children with newly diagnosed asthma (50% of newly diagnosed patients had M. pneumoniae infection compared with 5.2% of stable asthma patients). Along with the different bacteria, respiratory viruses were tested for within the participants; however, major comparisons were not made and coinfections not looked at. Further to this, of those children infected with both bacteria and who were experiencing their first attack, 62% had asthma recurrences compared with only 27% who were not infected. Some individuals with asthma (approximately 2.5%) can become chronically infected with the fungus Aspergillus fumigatus, causing the disease allergic bronchopulmonary aspergillosis (ABPA). ABPA can cause bronchiecstasis (chronic inflammation of the airways and decreased mucus clearance, leading to chronic lung infection) and sometimes death. A. fumigatus acts as an allergen and pathogen, and also sensitises the sufferer to several other fungal pathogens. Clinical data now indicate that microorganisms are the main cause of asthma exacerbations, with many cases of wheeze in children less than 1 year old linked to asthma later in life. However, many aspects of the interaction between asthma and microorganisms are still not well-understood. 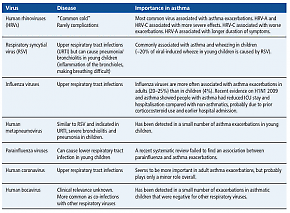 Why do some children with wheezing HRV/RSV infections go on to develop asthma and some do not? 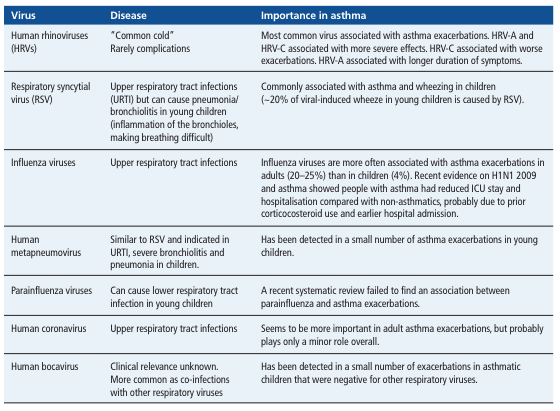 Why do some children with viral respiratory infections have more severe exacerbations of their asthma (leading to hospitalisations) and some do not? Further studies are needed on the severity of these infections and the resulting impact on asthma symptoms. The likely benefits of such studies are enormous in terms of reducing the clinical impact of asthma. Modified and reproduced from Microbiology Australia, with permission of the Australian Society for Microbiology. References for the article are available at http://microbiology.publish.csiro.au/nid/206/issue/7047.htm.